When I first heard that Mike Ranta was planning a solo canoe trip from the Pacific Ocean to the Atlantic Ocean I thought to myself that would be an incredible feat – but that it was impossible. I was proven wrong. 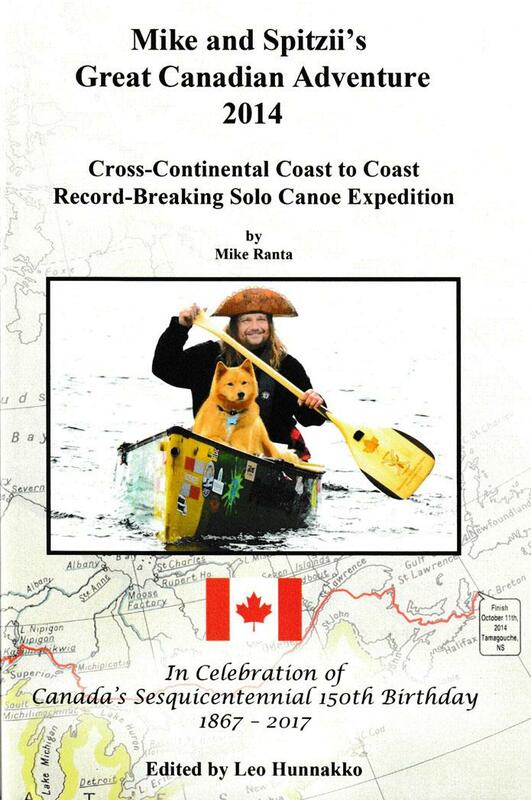 This book, Mike and Spitzii’s Great Canadian Adventure 2014, tells how a man and his dog accomplished this feat. Mike was raised in Atikokan and still lives there; on this trip he was following the example of Atikokan’s Don and Joe Meany. Don paddled on the Ontario team that raced across Canada from Rocky Mountain House, Alberta to Montreal in 1967 to celebrate Canada’s 100th birthday. In that same year, Joe and two buddies followed the same route in a three man kayak. Another Atikokan connection is that Mike and Spitzii were using a Souris River canoe and XY Company paddles and both of these are world class products made in Atikokan by locally owned companies. Although he was paddling solo he had his dog with him. As you will discover in the book, it wasn’t just a dog – it was Spitzii the wonder dog. Spitzii does everything a good bow paddler does except paddle. Spitzii scans the water ahead and woofs when he spots a submerged rock, log or any other obstacle in the water. Dogs have much better hearing than humans and he hears rapids and waterfalls well before Mike hears them. Mike said that a couple of times he woofed and looked back at Mike when they were beginning to cross a wide part of a bay to save time on Lake Superior. He evidently heard rumblings in the distance and was warning about an approaching storm that wasn’t yet visible. Mike learned to respect these warnings and immediately look for a place to land the canoe when he got a warning woof from Spitzii. Bear warnings and wildlife spotting are also part of his repertoire. Mike left Vancouver on April 1, 2014 and paddled up the Fraser River all the way to Hope, British Columbia where he found that creeks heading east into the mountains were still frozen and it was not possible to canoe any further. He had to take to the side of the highway and pulled his canoe and all his supplies on a wheeled cart. He found that the traffic on the highway – especially the trucks – made this the most dangerous part of his trip. He walked for seven days up and over the Cascades. He got back onto the water on the Similkameen River where he had a big scare. He came around a sweeping curve, saw rapids ahead and couldn’t get to shore in time and ended up in the cold, glacial fed water under his over-turned canoe. Fortunately, both he and Spitzii got to shore before being swept down the rapids. This was just one of many examples of times when Mike found that he should expect the unexpected on a trip of this magnitude. At this point, Mike had crossed the Cascades but now he had to get up and over the Rockies. It was a challenge to travel this diverse and wildlife rich area. One morning he woke up near Revelstoke, British Columbia to six inches of snow and -5 Celsius. At another point he was walking in 2 ½ ft of snow while pulling his canoe behind him. They encountered many bears on their journey, but near Golden, British Columbia they (Spitzii is like a person in this book) saw a cougar print embedded in a bear print. Another memorable sight was a herd of elk crossing the river in front of them in Alberta. Mike left Vancouver on April 1, 2014 and arrived in Tatamagouche, Nova Scotia on October 31. 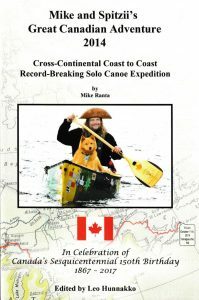 Mike was the first person to cross the North American continent solo by canoe in one canoe season. Mike raised $50,000 for the Atikokan Youth Initiative Centre on this trip. Mike also did a solo trip across Canada in 2016 and raised money for Canadian Veterans. This coming summer he is planning a trip from Bella Coola, British Columbia that will follow Alexander Mackenzie’s 1793 route over the Rocky Mountains and on to Montreal. He will then continue on to Nova Scotia. Spitzi will again be in the bow of the canoe and another solo canoeist will accompany him. This trip will be a little bit longer and also more difficult. His friend Don Meany once told him that “if you can’t go through it, go around it. If you can’t go around it then be damn sure you can go through it.” That attitude is on display in this book and it will be present on any future trip.